Going away on an extended business trip for a week meant that my birthday composter got an extra large helping of partially decomposing stuff this morning and multiple spin cycles. Have you ever touched fuzzy zucchini? If you haven’t, it’s slimy and furry at the same time. Like it’s covered with soggy white hair. Now you can safely skip seeing it yourself and say “ew” with me. You’re welcome. Same goes with celery that’s gone bad. It turns into a pile of limp, watery yet fibrous brownish slime. Again, thank me for sharing that visual. Hopefully you’ll never have to see it in real life. It’s not pretty. But all those fuzzy and slimy veggies made the composter really happy. It’s been cooking away and breaking down everything I’ve been feeding it for the past month. No bad smells. No animals breaking in for “treats”. No unwelcome bugs (I’m hoping that earthworms find their way inside naturally). The produce peels, tea bags, coffee grounds, parsley, egg cartons, toilet paper cores, napkins, dryer lint, dog hair, rotting produce, apple cores, banana peels, egg shells, grass clippings, leaves, pine straw, garden waste, tomato vines, newspaper, and paper towel rolls are turning into the stuff gardeners love. This batch is almost finalized (there is a limit to how much you can put in) and then it will sit for about a month until everything is broken down. I’ll start its twin and by the time that one is ready to go, the first one will be finished the process. Yes, it is a little bit of work. Some re-training on what not to throw away. A trip out to the composter every other day or so. Washing out the little collection bucket when it gets gross. 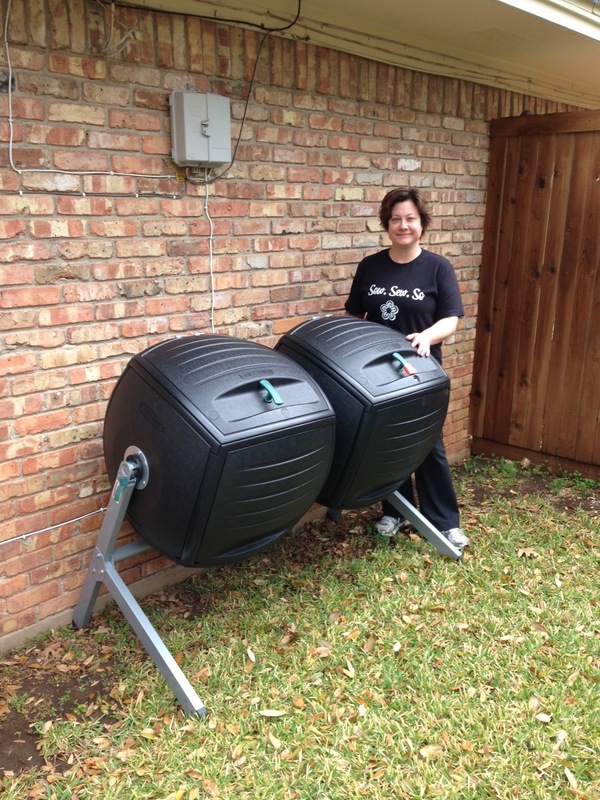 Spinning the composter. I think of all of those things as fun—and an investment in future crops. It’s pretty exciting to think that what is basically garbage is turning into fertilizer and a growing medium for the Mortroski Midcentury Urban Farm. It’s all going down in a very under-utilized part of the side yard by the plum and peach trees. And soon I’ll be able to load up the wheelbarrow and take freshly made compost over to the raised beds. Composting is kind of like growing stuff. It’s dependent on a variety of factors (materials, weather, water, heat). Even if you think you’ve timed it perfectly, it may take fewer (or more) days than you think. It can be a bit dirty. But in my opinion, it will be well worth the effort—and the wait. This entry was posted in Sow and tagged compost, composter, earth day, garden, gardening, Julie Petroski, Mortroski Midcentury Urban Farm, peas, raised bed, sow, trash, water, weather, work. Bookmark the permalink. Thank you very much, Amy! Super sweet of you to put me in such fine company.